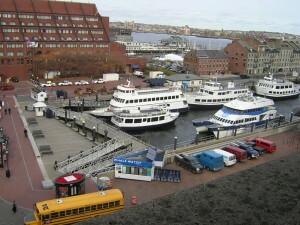 Childs Engineering Corporation, as a consultant to the Boston Redevelopment Authority, was responsible for all phases of investigation, construction documentation and construction monitoring of a new pier, floating dock, and articulated ramp access system to service Boston Inner Harbor water transportation ferries. Part of the project included inspection of the Long Wharf seawall and hydrographic survey of the immediate area. The $2 million project is part of an $18 million long-term plan for establishing Long Wharf and Central Wharf in downtown Boston as the principle inner harbor and harbor island marine transportation terminal. Childs Engineering developed innovative solutions to provide full accessibility from the pier to the floating dock’s deck during mean tide conditions. This was accomplished through a series of articulating and fixed ramps located on the floating dock surface. The marine terminal is fully accessible in accordance with ADA requirements and Massachusetts Architectural Access Board rules and regulations. The project was completed on time and approximately $100,000 under the $2,000,000 construction budget.